At the beginning of the month, I embarked on a journey towards a braver self. At least for the next 30 days. 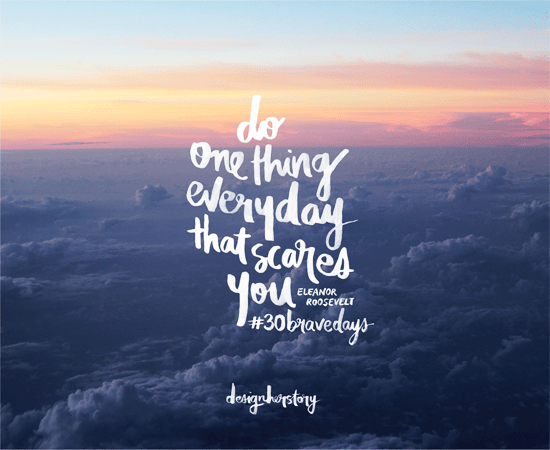 Arriane of Wanderrgirl started #30BraveDays in an attempt to coax out some of the courage that’s nestled deep within people, courage that’s often tamped out by the often much louder fears. I started out at the beginning of the month (my post is here) and I wanted to do a weekly update. 30 days aren’t divisible by a week or seven days, though, so I decided on a 15-day recap instead. Since starting this challenge, I’ve made a few discoveries about myself. It’s kind of sad to think about it, but I said I’d write about it, so here goes. I’ve always been the kind of person who thinks up grand plans, but cowers at the first sign of struggle. I don’t know if it’s because I was raised in an environment of comfort, or if it’s because I don’t want to disappoint other people with what I want, or if it’s because I pre-empt a possible failure with the idea of a guaranteed bust. I jump the gun in the worst way, which actually means that I don’t even bother shooting at all. I aim but I don’t pull the trigger. I’m so sure that the bullet will land way off the mark, and sometimes I think that my brain feels like it’s better to not even try at all. On Day Three, I went to a talk for further studies, and I ended up thinking about all of the opportunities and plans I let slip because I just couldn’t be bothered to follow through. And that’s sad. I am guilty of thinking things like “It’s not going to happen anyway,” and this defeatist in me makes it so hard for me to find a way to make things happen instead of giving up mid-way or even before I start. To my credit, I do push through with some things, but it’s often the things that have a more or less high success rate. If it’s a thing that’s likely to succeed, then I’m on board. I think that a lot of the time that I’ve put myself out on a limb or risked, I got burnt and my immediate reaction in the face of challenges is to recoil. And that’s not bravery at all. Another thing I’ve confronted with this challenge is the fact that I am scared of way too many things. I don’t think I used to be this way… it’s kind of scary how much a person can change without even realizing it. But, insofar as I’ve gained courage in some parts of my life, I think I’ve lost a lot of it, too. I’ve said this before, but I’ll say it again: I am way too concerned about what other people think of me. And that’s a crappy way to live. My first fifteen days of “bravery” are, to my eyes, kind of pitiful. In my last post, I asserted that many people are different, and fear is relative, as is bravery. While this is true, I don’t want to be the kind of person who is afraid of everything. Great risks come with great payoffs. Or great failures. It’s almost always a 50-50 thing, and I think I want to be on the side that believes in Making It. Day Three: Attend talk for further studies; met online friend Mika! Day Fifteen: Wrote about my fears; who knows what else? The day’s not done! See you at the end of the month! Feel free to join in. Just offset the days so you do a full thirty day challenge.